Ariane 5 has marked a new chapter of operational service with its 75th launch success in a row, and Arianespace is celebrating the milestone – achieved this month – with a dedicated website page that brings together videos, key facts and mission highlights underscoring the heavy-lift vehicle’s track record of reliability and service. 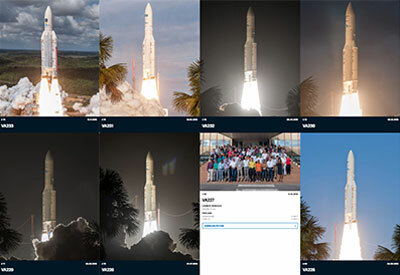 Among the features of Arianespace’s dedicated website page are interactive “tiles” with details on each flight in Ariane 5’s consecutive string of on-target missions, including liftoff images and launch team photos, plus information on the payloads. Arianespace’s dedicated website page includes interactive “tiles” with details on each mission in Ariane 5’s 75 consecutive launch successes. With its latest launch achievement, Ariane 5 now holds the record for consecutive missions accomplished among Arianespace’s launcher family operating from French Guiana – surpassing Ariane 4’s string of 74 in a row from 1995 to 2003. And “75 in a row” is far from Ariane 5’s only impressive figure. During the 13-year period that began in 2003, the launcher deployed 149 spacecraft for commercial and institutional operators, with over 623 metric tons (1.4 million pounds) delivered to orbit. Billions of people have benefited from the space applications deployed via Ariane 5 – confirming this heavy-lift vehicle’s unrivaled reliability in the commercial market, along with its availability and flexibility for a wide range of missions to various orbits. For photos, videos and other multimedia content that captures Ariane 5’s ongoing achievements, visit the Arianespace website’s dedicated page, and follow Arianespace on Twitter and Instagram. Then get ready for the next success!